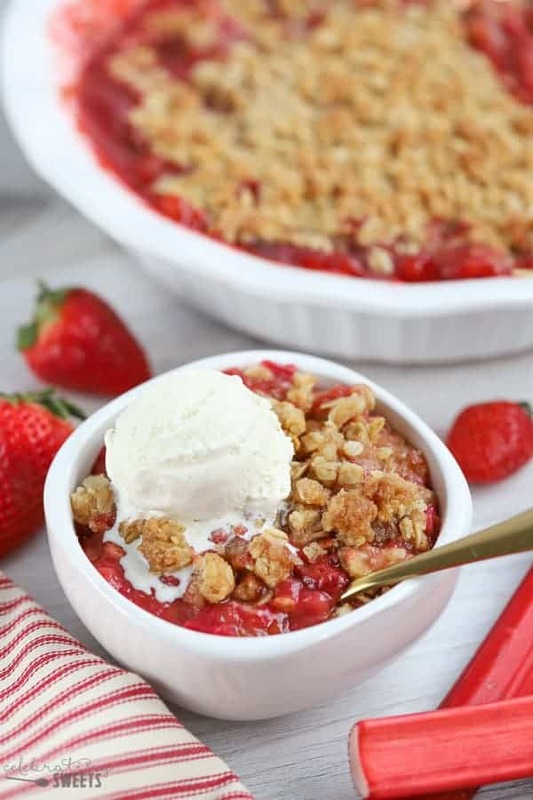 This Strawberry Rhubarb Crisp is filled with fresh rhubarb and juicy strawberries and topped with a brown sugar oat crumble. Serve warm with vanilla ice cream. 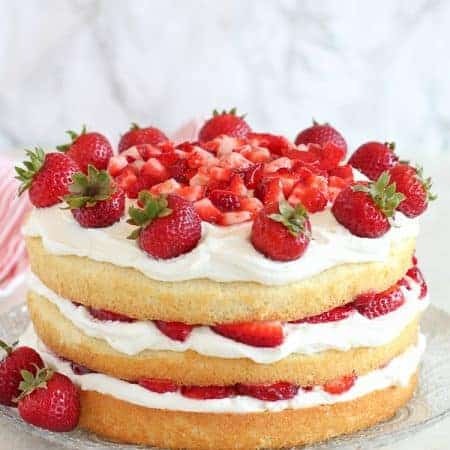 A fantastic spring dessert! We pretty much jumped from winter to summer here in the desert. It’s supposed to be 90° next week (ugh), but that’s not stopping me from making as many springtime recipes as I can. 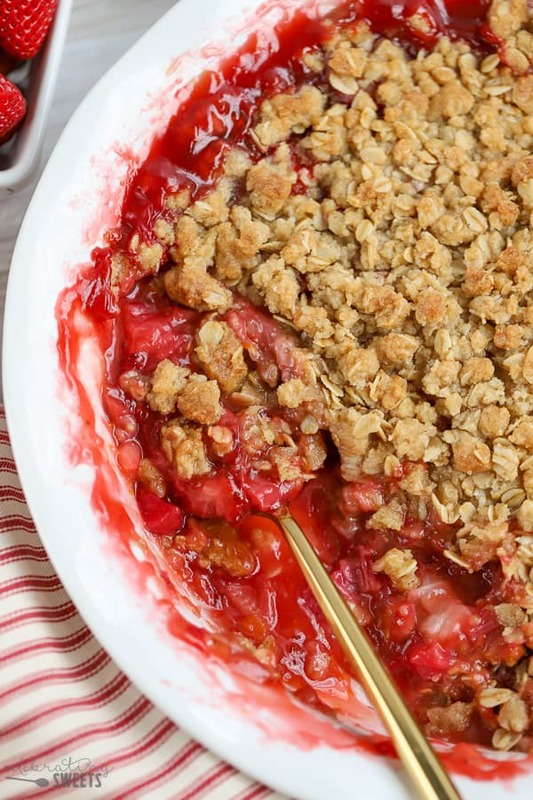 Nothing says spring like strawberries and rhubarb. 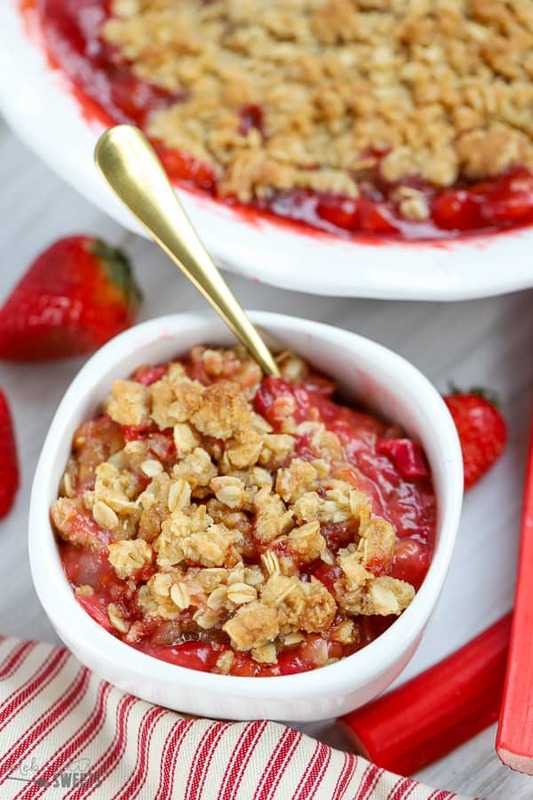 So here they are, paired in a delicious, beautiful and easy Strawberry Rhubarb Crisp. 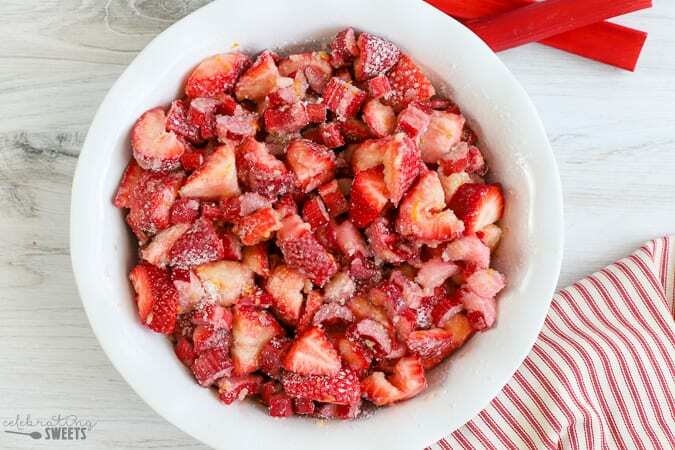 Combine chopped strawberries and rhubarb with sugar, flour, vanilla extract, a splash of orange juice, and a little orange zest. Feel free to leave out the citrus if you’d prefer. Dump the fruit into a greased casserole dish and place in the oven. 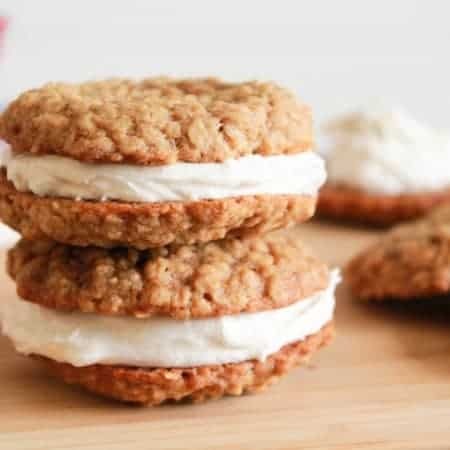 Combine the topping ingredients: flour, sugars, oats, cinnamon, salt, and cinnamon. Add melted butter and stir to combine. After the fruit has baked for about 15 minutes, remove it from the oven and add the topping. Return to the oven for about 30 minutes, until the fruit is bubbling and tender, and the topping is golden brown. Allow the crisp to cool slightly. Serve warm with vanilla ice cream. TIP: I like to cook the fruit for about 15 minutes without the topping. I do this for two reasons: 1) I want the rhubarb to have plenty of time to soften, but I don’t want the topping to burn. 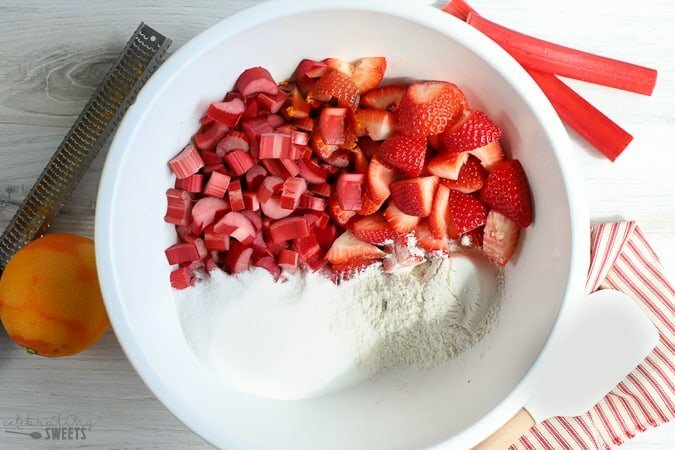 2) The strawberry and rhubarb juices get quite bubbly and they will start to bubble up over most of the topping if baked too long. 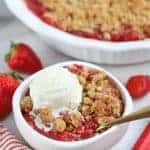 My absolute FAVORITE way to eat a fruit crisp is warm with a scoop of vanilla ice cream. You can also enjoy this crisp at room temperature or cold, straight out of the fridge. Can you eat this for breakfast with a dollop of yogurt instead of ice cream? YES! There are fruit and oats in it – two breakfast staples. I say go for it. Preheat oven to 350°F. Grease a 2 to 2 1/2 quart baking dish (I have used a 10-inch deep dish pie plate, 9x9 square baking dish and 7x11 casserole dish). Set aside. 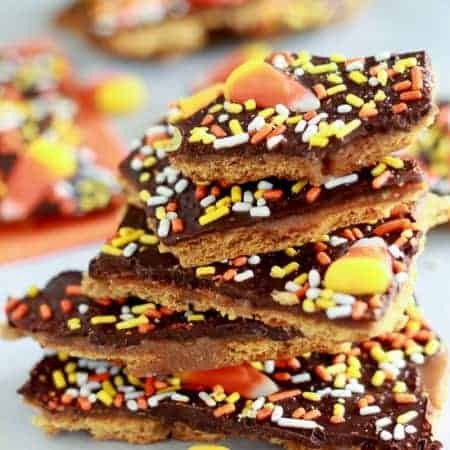 In a large bowl, combine all filling ingredients. Stir gently until well combined. Dump into prepared baking dish. Place the baking dish in the oven and bake for 15 minutes (without the topping). Proceed with making the topping. In a large bowl, combine oats, flour, sugars, salt, and cinnamon. Add melted butter and stir until well combined. After the fruit has been in the oven for 15 minutes, carefully remove it and sprinkle the topping over the fruit (pressing some of it together with your fingers to form clumps). Bake for another 30-35 minutes*, until the fruit is bubbling, the rhubarb is tender, and the topping is light golden brown. Place on a cooling rack to cool slightly (it will thicken the more it cools). Serve warm with vanilla ice cream. I will be making this on repeat all season long! Loving everything about this! It’s on the menu for dessert tonight! I adore strawberry and rhubarb! This is SO good! I just picked up strawberry and rhubarb the other day and then I saw you shared this – total fate!!! This was delicious and a perfect spring/summer dessert.